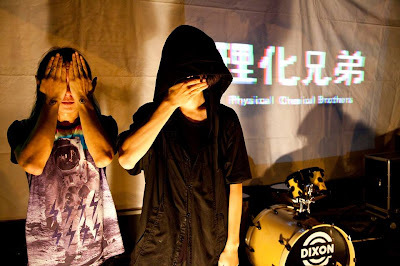 Zhaoyu lin(DJ) and YJ(VJ) were long lost friends that serendipitously met at a temple fair, where they each took a elixir from the armpit of buddha, hence, the physical chemical brother. Their current focus is on 8-bit music, also known as chiptune or Gameboy music. They reinvent and explore what used to be the topnotch audiovisual technique through means of contemporary technology. The sphere of experience shifts through arcade games, parties, and performance, engaging in dialogue with various audiences.